Some mischievous looking Tawny Frogmouths with Mum and Dad thinking "will they ever go to sleep?". Frogmouths are acrylic on A3 size Canson Canvas Paper. I have no training in painting (started painting in Jan 2013) and belong to what I have termed the Mistakeist School. I find if I fix up enough mistakes I'll end up with a painting....seriously. I often have two or three colours on the brush at the same time and see what happens. Then I fix up the mess if there is one. The Frogmouth's colours are white, mid-grey and paynes grey. The Frogmouth's background (can't remember the colours) is the build-up of quite a few layers which took about 4 hours and the Frogmouths about another 4 hours. I find highlighting edges, if done well, brings a painting to life. I will post a few more paintings in the future. Thanks for taking an interest in my painting. Thanks so much for your submission. 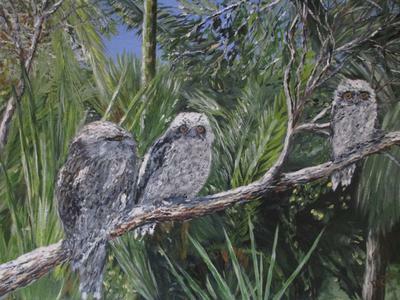 We love your other Tawny Frogmouth painting which you submitted a while back as well. However I'm sure I'm not the only one wanting to know a bit more about this painting! Unfortunately I don't have an email contact for you, but if you could please send us a little more information about your painting, for example what paints you used, any challenges you faced and overcame (or not!) and any happy accidents that were encountered along the way! We love reading about people's journey's with their paintings, not only the lovely end result!